That thing we all said couldn't happen, did happen. 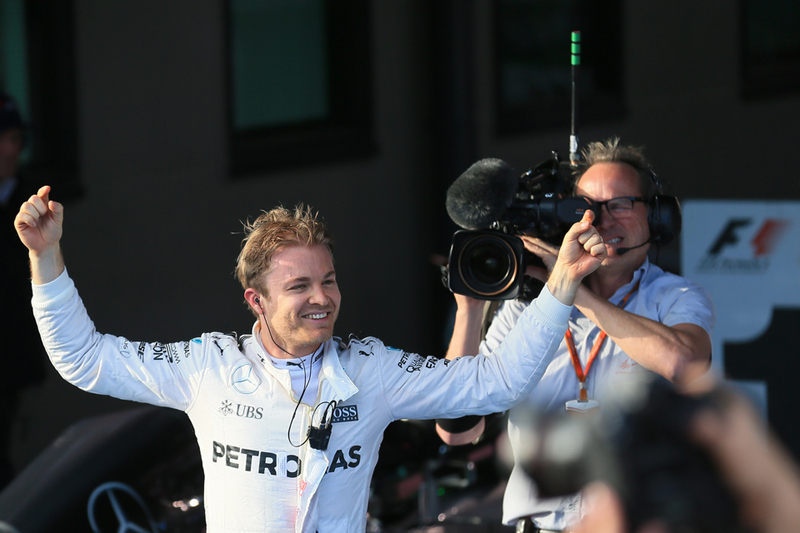 We couldn't have another weekend in which everything would fall for Nico Rosberg, giving him an open goal in which to drive the ball home with aplomb for victory. But that's what we got. Again. Four wins from four this campaign are his. 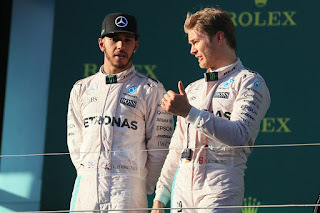 In the Russian Grand Prix today luck didn't turn; things didn't begin to regress to the mean. Yet it would be harsh in the extreme to say that has been the entire story. Yes Nico by his own admission has had the fortune so far in 2016, but that's hardly his fault, plus there is little to say that whatever the distribution of chance thus far Nico is at anything other than the top of his form right now. Fast, flawless, nailing things when it matters, that all continued in the Sochi weekend too. And perhaps to bring emphasis to that it's not all a matter of Goddess Fortune smiling his way, Rosberg set a fine fastest lap of more than a second under the track record on his penultimate tour, long after the important matter of 25 points was framed as coming his way. Now he has a seven up of consecutive wins - only the fourth in history to do so - and probably more important a ton up in points already. Some four rounds in we still await our straightforward weekend where we get our close fight and measure of the lay of the competitive land between not only the two Mercedes but also between the Mercedes and the Ferrari. In these regards we're not much further forward than where we were in pre-season testing. Yet in the meantime Nico is making all of the hay he can as the sun shines upon him, and going a long way to building a title with it. "I'm aware of the fact that my direct competitors had a couple of mishaps which for sure helped me this weekend" said Nico on this subject afterwards, "still [I'm] enjoying the moment and love winning races". Even Nico though expressed a little regret that we haven't seen anything mano-a-mano at the front this season thus far. "Well, a straight fight to Lewis [Hamilton] is what I'm here for" he said, "you know that's the best in racing because he's the benchmark in the end and I look forward to when it happens again. And it's always going to be a tough battle against him because just as before he's as motivated and as quick as ever. "I can't say I miss it really as it's awesome to win" he went on, "and I want to win races and in the end it doesn't really matter how....But of course the ecstatic feeling isn't there, it's there when I win a battle against Lewis, that's really where I get the ultimate thrill". And once again just as in many previous rounds this year after the opening turn or so Nico was rather smelling of roses, and the races of his presumptive closest challengers were compromised, in one case fatally. Lewis Hamilton in apt echo of the previous round in China had an engine problem in qualifying, though this time it hit at a point that required him to start tenth rather than last. Sebastian Vettel also had his Sunday tainted in advance, with a five-place grid drop thanks to a gearbox change, turning his P2 from quali into a P7 start. 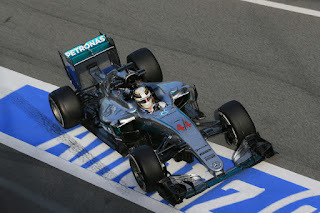 Even so however his best was upwards of half a second off Nico's and indeed in no Friday or Saturday session in Sochi had anyone got within that range of the Merc's best mark. But there was a sting in the tail for Seb and his penalty as being in the pack bit him and ended his day. Indeed he was hit twice, first in the back under braking for the tight turn two and then again more definitively in turn three, sending him frisbeeing into the barriers. And conforming with this sport's wicked sense of irony it was none other than his nemesis from China Daniil Kvyat doing the hitting. Unlike in China it was definitely Kvyat at fault this time, But equally in the humble opinion of this author in neither clash was his driving as egregious as some have been trying to make out. In the first contact it was the sort of tap in the back we see frequently in the concertina of a big braking zone early on the opening lap, while in the second - while it looked a worse offence - there were the mitigating circumstances of Vettel and Sergio Perez both going slower than you'd expect for their own peculiar reasons. Audible calls out there for race bans - or being hung from the front of the Sochi grandstand - are surely excessive. In fairness too Vettel afterwards, while clearly livid about his lot, resisted temptation to dredge up the Shanghai clash depsite some cajoling. 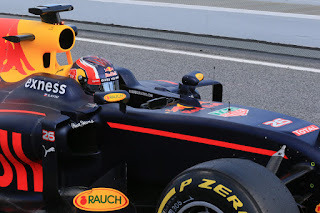 Kvyat too didn't shirk his responsibility to any great extent. This unusually helped Hamilton, aiding his vault up to P5 at the off. He then jumped Felipe Massa immediately for P4 when green flag racing resumed following the clean up and not long later ambushed Kimi Raikkonen for P3 around the back of the track with a move that was a lot like him - opportunist, brave, unorthodox. It took him rather longer to clear Valtteri Bottas in second, demonstrating what many thought in advance that a well-driven Williams would be the hardest thing for Lewis to clear. Indeed he followed him for the rest of the opening stint, apparently unable to even get near to the back of the FW38. It looked for the briefest of moments that Lewis and his team might also have dashed his one opportunity to pass on strategy. Once again in a Sochi race the one-stopper was a no-brainer. Bottas was the first to blink, pitting on lap 17, but Lewis rather than press on in the new clear air pitted himself just a lap later, and emerged still behind Bottas. But a lap on with his fresh boots it mattered not as he out-braked Bottas neatly into turn two. Once Nico had pitted himself the gap between the two Mercs in first and second was something like 12 seconds, which equated to near enough half a second a lap until the end for Lewis to catch, but Lewis nevertheless set down to it. He was looking good on it too for a time, getting the gap down to around seven seconds by lap 36 with 17 remaining. But in keeping with another chief theme of this season so far just at the point that things looked to be coming together for him his hopes were diminished again, as his team radio crackled and his engineer told him that he had a "water pressure issue". 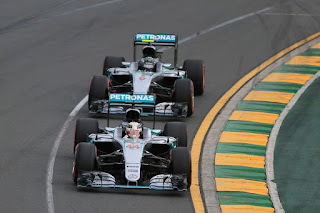 Immediately Rosberg put a second plus a lap on him and as far as the win was concerned the game was a bogey, the only matter about the first two places to be resolved was whether Lewis could make it to the end. He did, as he was informed a few laps later that the "issue had stabilised". Nico following his latest triumph for the first time showed some visual hints of getting used to it all, but his words still radiated is usual glee. "I was feeling really comfortable today, especially at the end of the race", he said. "In the last 15 I opened the gas and pushed a little bit more because I knew it was safe to push and definitely get to the end of the race with that set of tyres. It was working really well. The whole weekend. Even in qualifying. [I've] seldom had such an awesome car. So, special weekend." While for all that it seemed samey it was in fact Nico's first Grand Chelem of his F1 career - win, pole, fastest lap and leading every lap. Lewis still "definitely" viewed the result - P2 from a P10 start - as a save, and paid tribute to his mechanics that did the required all-nighter as well as batted away the latest round of sabotage suggestions seen online. He didn't seem thrilled with his lot though, the brave face of the previous round now not quite as present this time. Probably understandable. As for his technical problems in the race, "there wasn't a doubt in my mind that I could win it" Lewis insisted. "I had the pace but then I problem with the engine again, so I had to back off....I wasn't at full throttle down the straights, so just trying to look after it." Nico as you might expect didn't agree, and insisted he felt he had the thing under control nevertheless. "I knew the gap to Lewis and it was just through the traffic [that it fluctuated]" he said. "If I get the traffic first I lose a couple of seconds, then he gets it and it opens up again." And Merc boss Toto Wolff added after the race that Nico had technical problems of his own. And Lewis a bit like Vettel faced a further potential sting in the tail, with Wolff commenting that the damage resultant of the water pressure problems may make his engine unusable for future rounds. Perhaps Lewis had this in mind when he commented after that he has this season "a long way to go with not so many engines". Kimi followed them home in third half a minute after Rosberg - and with his problems still seven seconds after Lewis - stating the obvious that the combination was "just not fast enough". There then were two Williams fourth and fifth, with Bottas himself finishing 50 seconds after Nico, on a track that is thought to especially suit the Grove machine. Again the vague sense of this campaign being underwhelming for Williams lingered. The opening lap shenanigans did much to frame the race, as some from lowly grid slots were able to make up many places amid the uproar. 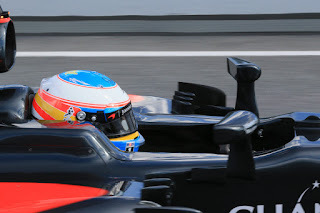 Once it had all shaken out on lap one Fernando Alonso had got to P7, Romain Grosjean P8 and Kevin Magnussen P9. And indeed all remained high, in the points, by the end following fast and unflustered drives. All gained a place when Max Verstappen dropped out later with an engine problem, while Magnussen also managed to work his way by Grosjean. Perez also deserves mention for bagging two points having himself being sent to the back by lap one's goings-on. The usual best of the rest Red Bull however had a poor day, started by both being damaged in the first lap frolics and then both took a bum steer on strategy by taking on the medium tyre. Neither scored. But further ahead the considerations are largely as they were after China. The season remains a long one and no one doubts that Lewis and Seb with trouble free weekends will remain formidable foes. But the championship lead Nico has established - some 43 points on Lewis and a whole 67 on Vettel - will not be quickly or easily surmounted. Not with the way Nico is going anyway. Going in a way that is not reliant on the luck he's been getting.